RICHMOND, Va., Oct. 11, 2018 — By popular demand, Power Distribution, Inc. (PDI), a pioneer of innovative power transformation, power distribution, and intelligent power monitoring solutions for mission-critical operations, will be displaying its award-winning solutions for mission-critical facilities, at 7×24 Exchange Fall Conference in Phoenix, AZ (Booth #1 & 1C in Rotunda). With a conference title of “Metrics of the Future,” PDI’s PowerPak2 PDU, Modular Compact RPP, WaveStar® Infinity Monitoring System and PowerWave 2™ Busway System make an ideal complement to the event’s theme while providing IT personnel and facility managers a clear path to ensure end-to-end power reliability. Held on October 21-24, 2018 at the JW Marriott Desert Ridge, 7×24 Exchange’s conference is committed to addressing the challenges of power sustainability. PDI’s innovations not only address sustainability with an easy-to-use and highly-reliable overhead power busway distribution system, but they also mitigate the risks of injury during maintenance procedures by providing a True Front Access (TFA) static switch which enables installation, maintenance, service and IR Scanning from the front of the enclosure. 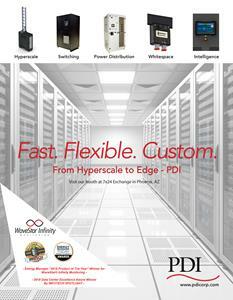 PDI’s WaveStar Infinity innovation is one of 2018’s most decorated power innovations, receiving such awards as 2018 Data Center Excellence Award winner by InfoTECH Spotlight and Top Product of the Year honor in the Environmental Leader and Energy Manager Today Product & Project Awards for offering real-time sensing, measuring, collecting, calculating, reporting and alarming for power distribution equipment on desktop and mobile devices. Power Distribution, Inc. (PDI) is a pioneer of innovative power transformation, power distribution, and intelligent power monitoring solutions for mission-critical operations. The company leverages their ISO standards-based manufacturing facilities in Virginia and California, as well as partner and customer collaborations, to create the broadest range of award-winning solutions in the industry. Through the PDI and ONYX brand names, these industry leading solutions are sought after by data center, industrial and other mission-critical facilities and backed by continued global service and support. The net result: One company to provide and to service the end-to-end power needs of a 24×7 connected world. For more information, please visit www.pdicorp.com. PDI will showcase its innovative, award-winning PowerPak2 PDU, Modular Compact RPP, WaveStar® Infinity Monitoring System and PowerWave 2™ Busway System at 7×24 Exchange Fall Conference.